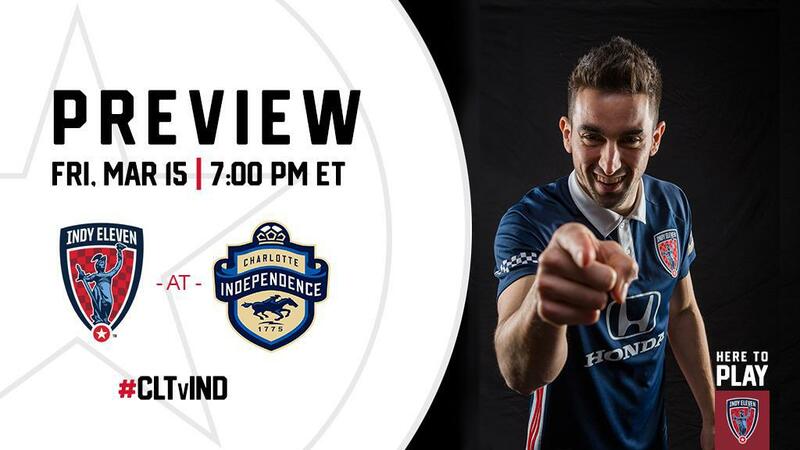 Indy Eleven aim to capture the first three points of the season against Charlotte Independence in the team’s second road game in as many weeks. The Boys in Blue look to improve their all-time record against Charlotte, which currently stands at 1W-1D-0L. Indiana’s Team fell in their first match of the 2019 USL Championship season 2-1 on the road against Saint Louis FC. Indy Eleven Head Coach Martin Rennie’s side featured several new faces during the matchup, some of which included defender Neveal Hackshaw and forward Josh Penn. Hackshaw excelled in his Boys in Blue debut as he completed nearly 90 percent of his passes, acted as a stiff presence in the back third, and scored Indy’s only goal of the match in the 61st minute. Youngster Penn also caused havoc down the flanks for Saint Louis, as the 18-year-old nearly scored a goal in the 19th minute and almost assisted forward Dane Kelly in the 48th minute. Despite his best effort, the USL Championship all-time leading goal scorer watched his header clang off the post. Even though Indy dominated possession and created seven chances, the side fell 2-1 on the road. The focus is now claiming points in Charlotte. Charlotte Independence begin their 2019 USL Championship season against Indy Eleven on Friday night after having a bye week in league’s opening weekend. The side will play its first competitive match after a preseason loss to 2018 Major League Soccer champs Atlanta United on March 2, finishing the preseason with a 3W-1D-1L record. Charlotte, now with first-year head coach Jim McGuiness leading the charge, will look to bounce back from a 2018 USL Championship season that saw the side finish 11th in the Eastern Conference standings. Charlotte’s defense could prove to a soft spot in the side after allowing 57 goals in the 2018 season, the fourth most goals conceded in the Eastern Conference. The Independence were able to move the efficiently in the midfield last season, completing 80 percent of passes played throughout the game. Midfielder Tyler Gibson was one of four FC Cincinnati players signed in the offseason by Coach Rennie. Gibson’s presence in the midfield can be felt most with his quality of play. The 28-year-old navigates the ball with precise accuracy through passing channels, helping to facilitate counter attacks and control the pace of the game. During the match against Saint Louis, Gibson completed 91 percent of the passes he played. He also completed 88 percent of the long balls he played through the midfield. Accurate passing isn’t a new concept to the midfielder, who averaged 84-percent passing accuracy last season. The man that will martial the midfield of Charlotte Independence is veteran Jorge Herrera, something the midfielder has been doing since 2015. His 106 appearances for Charlotte have led to the Columbian finding the back of the net a total of 36 times. The 38-year-old led Charlotte in goal scoring last season, scoring 13 goals in 30 appearances. He also moved the ball well through the midfield, averaging just under 80-percent passing accuracy and creating four assists for his teammates. The Boys in Blue midfield will need to keep a close mark on the midfielder in order to keep the first clean sheet of the season. Friday night’s matchup will feature two prolific strikers in Indy Eleven’s Dane Kelly and Charlotte Independence’s Dominic Oduro. Both forwards have impressive resumes in regards to scoring goals, as Kelly is the USL Championship all-time leading goal scorer and Oduro spent 16 years in MLS. Kelly looks to open his goal scoring account with Indy Eleven on Friday after nearly getting things going against Saint Louis. The forward, who signed with the Boys in Blue in mid-January, struck the post against Saint Louis after youngster Josh Penn played him a cross. Then a dozen minutes later, the Jamaican saw his well-placed penalty kick saved by Saints goalkeeper Jake Fenlason. With a mind for the back of the net, Kelly will be eager to capitalize on any goal scoring opportunity that comes his way. Kelly’s opposite will be 16-year MLS veteran, forward Dominic Oduro. One of the paciest forwards ever to play in MLS, the 33-year-old has featured for sides like FC Dallas, Columbus Crew, New York Red Bulls, Chicago Fire, Toronto FC and Montreal Impact. He’s used his searing speed to score 63 goals in 346 appearances. In addition to scoring the goals, the native of Ghana can create them as well. The Charlotte forward has assisted on 32 goals during his extensive career. Each forward will look to put their mark on Friday’s fixture as the two players look to score their first goals for their clubs. Indy’s backline will need to work hard to keep tabs on the pacey Oduro, and Charlotte will need to mark the Kelly in the 18-yard box in order to keep a clean sheet against an Indy Eleven side they have yet to defeat. Don't miss a second of the Boys in Blue on the road. All home and away USL Championship matches are available at your fingertips with ESPN+. New users can click here or visit plus.espn.com to start a seven-day free trial.